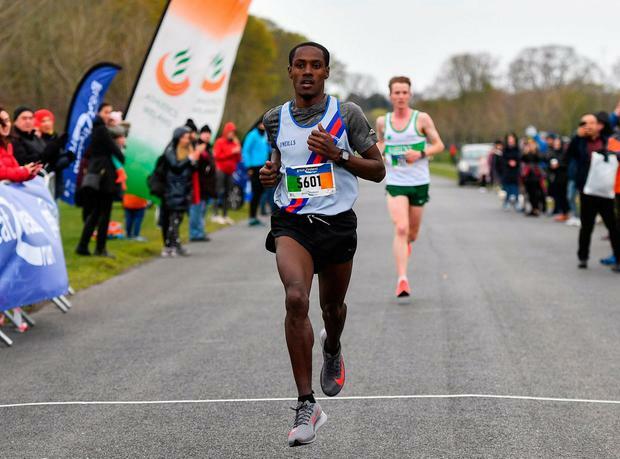 Tonosa, of Dundrum South Dublin, claimed his first title in the men’s race, covering the 10K course in 30:41 to defeat national cross country champion, Kevin Dooney of Raheny (30:44). Declan Reed of City of Derry Spartans was third in 31:07. Mullen was a comfortable winner of the women’s race, the Metro St Brigid’s runner clocking 34:52 to defeat Donore’s Barbara Cleary (35:18) and Iveragh’s Grace Lynch (35:33). Meanwhile, Fionnuala McCormack will tackle her first marathon since 2016 in Boston today, a race that gets under way at 2:32pm Irish time. The 34-year-old will take on a world-class field that includes Americans Jordan Hasay and Desiree Linden, Kenya’s Edna Kiplagat and Ethiopia’s Worknesh Degefa. A top-10 finish would guarantee Olympic qualification, but the Boston course is not eligible for time qualification, given its net elevation drop. McCormack’s best time remains the 2:31:22 she ran to finish 20th in the Olympic marathon in 2016. After taking a year out to give birth in 2018, she returned to the international stage with a superb 18th-place finish at the World Cross Country last month. Cathal Dennehy Phil Healy made a flying start to her outdoor season at the Irish Universities Athletics Championships in Athlone on Saturday, the Waterford IT athlete blitzing her opponents in the women's 200m to win in 23.04.